Netgear launches NeoTV Smart TV box | What Hi-Fi? Netgear has announced the NeoTV smart TV box, an internet-enabled streaming player that will connect to any TV with an HDMI input. The NeoTV will also come with a Remote app for iPhone and Android allowing you to control the box using your smartphone. The NeoTV is capable of streaming 1080p HD video wirelessly or over ethernet, while there's also a digital optical output for 5.1 sound. Initially set to launch in the US, the box gives you access to YouTube, Facebook and Twitter, streaming services such as Netflix and Napster. Content partners have yet to be confirmed for a UK box. 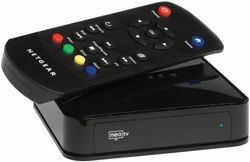 Due later this month in the US, the Netgear NeoTV streaming player (NTV200) set to sell for $80.